Porcelain veneers act like a false fingernail placed over the front surface of the tooth. After some minimal shaping of the tooth, the veneer can hide the original shape, colour or markings on a tooth. They are an excellent cosmetic option for front teeth. Crowns are used to repair broken teeth and protect the tooth by encasing it completely. 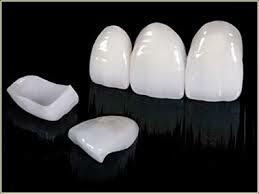 This is done using using porcelain alone, porcelain bonded over metal, or porcelain bonded to zirconia. The porcelain-metal crowns are strong and durable, but for the best appearance we prefer to use all-porcelain or porcelain-zirconia crowns especially where they are most visible, such as the front teeth. This gives you the best of both worlds, strength and beauty!